Engr. Rosario B. Rosete (left), Chief of Planning and Design Section inspects the surveying equipments worth P3M which includes Real-time kinematic (RTK) satellite navigation and state-of-the-art drone on July 9, 2018 at the Planning and Design Section. 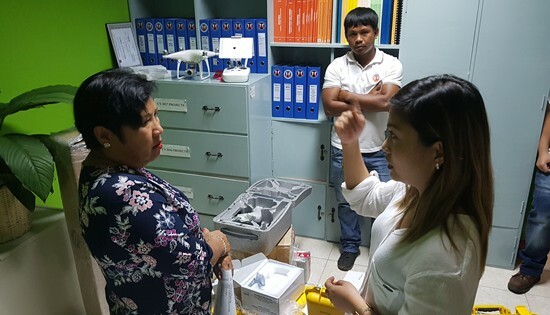 NAVAL, Biliran – The Department of Public Works and Highways (DPWH) Biliran District Engineering Office (BDEO) is now advancing its planning processes through the use of the newly acquired surveying equipments. David P. Adongay Jr., District Engineer said that BDEO has recently procured P3M worth of Real-Time Kinematic (RTK) satellite navigation and a state of the art drone that will help surveyors upgrade its planning and surveying methods. RTK positioning satellite navigation is a technique used to enhance the precision of position data derived from satellite-based positioning systems such as GPS, among others. 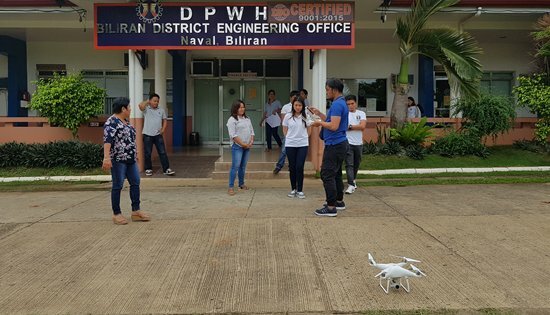 “The procurement of RTK and Drone will keep Biliran in league with its counterpart district offices which have already state of the art surveying instruments,” said Adongay. Engr. Rosario B. Rosete, Planning and Design Chief said that BDEO is previously using the traditional total station instrument to measure angles in both the horizontal and vertical planes. “The use of the latest model of RTK will lessen the tediousness in the preparation of plans in as much as the data gathered using RTK can automatically show the profile, traverse, contours and cross section of the project surveyed,” Rosete said.